As for progress on the book itself, only the last chapter (11) remains to be finished. Also, Episode One is now eleven chapters, rather than the previously mentioned ten. I’ll have to update the FAQ to reflect this. Up to chapter 8 has been edited, so that only leaves three more to do once I’m done. So, after that, and then giving it another quick once-over, I should be ready to upload it sometime this weekend (Nov 17 or 18). 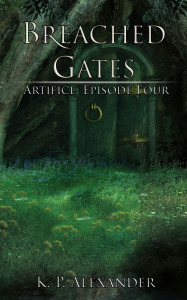 Artifice, Cover Art, Episode One, Release Date, Update. Bookmark.